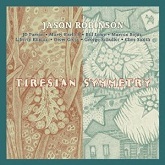 Review: "Robinson, Jason: Tiresian Symmetry" - Sea of Tranquility - The Web Destination for Progressive Music! Tiresian Symmetry is the latest Cuneiform Records release from saxophonist/composer Jason Robinson, a high energy, almost big-band jazz affair that at times even approaches the outer limits of free jazz thanks to the adventurous nature of all the musicians involved. Joining Robinson here are JD Parran (alto clarinet, contra bass clarinet, tenor sax), Marty Ehrlich (alto sax, bass clarinet, flute), Marcas Rojas (tuba), Bill Lowe (tuba, bass trombone), Liberty Ellman (guitar), Drew Gress (bass), George Schuller (drums), and Ches Smith (drums). Upbeat opener "Stratum 3" pushes the limits of jazz and comes across like Frank Zappa's large scale ensembles in the mid '70s, while the near 11-minute title track features a wealth of improvisations, including some wonderful, leathery solos from bassist Gress and plenty of squealing, squonking woodwind blasts courtesy of Robinson, Parran, and Ehrlich. "Radiate" has a quirky, sneaky vibe going on, with an underpinning of funk, as bulbuous bass grooves and stabbing clarinet soar over tricky drum fills and layers of jazzy guitar chords, eventually leading into another full band barrage of jazz-rock noise, with Ellman leading the way with some wild, distorted, feedback laden lead guitar solos. After the fast & furious "Saros" ( a real burner of a tune with some sizzling sax lines and tricky drumming), Robinson's haunting solo sax introduction to the complex "Elbow Grease" kicks in. Those who loved the early '60s Miles Davis band or even Ornette Coleman's groups of the same era absolutely need to hear this red hot example of complex, swinging jazz that borders on complete chaos at times. Things are much more structured on the melodic "Corduroy", which is a great vehicle for Ellman's tasty Wes Montgomery styled guitar licks, and the sultry sounds of "Cosmolographie" are driven to soaring heights thanks to the swirling sax and clarinets. Chances are Tiresian Symmetry won't be a jazz release for everyone, but if you have an open mind and a desire to experience instrumental music that isn't afraid to take chances and knock over any boundary in its path, then there's much to enjoy here. Jason Robinson has put together a real winner, and one of 2012's best jazz releases.